The HPP laser diode pulsers are the latest development pulsed diode driver development. Designed to be used with the LDD series drivers as the power source, the HPP pulsers can deliver up to 1000 amps of output current with full protection of the laser diode. Pulse widths of ≤50µs to CW can be achieved with rise/fall times of >10µs and repetition rates to 5kHz. A CW simmer current of up to 10 amps is available. Control of the HPP pulser via the standard 15 pin analog / TTL interface includes inputs for enable, trigger, output current, simmer voltage and CW / pulsed operation. The output is fully protected against open and short circuits along with over-temp. Two models are available: The HPP-750 which is capable of output currents to 350 amps and the HPP-6000 capable of outputting up to 1000 amps. 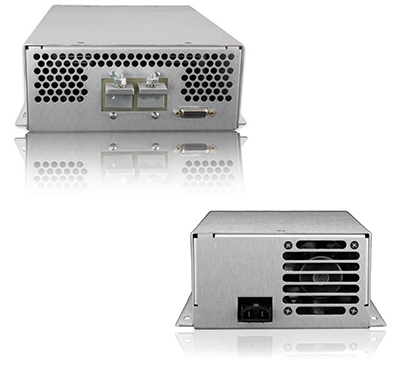 The HPP pulsers enhance Lumina Power’s complete line of laser diode driver products from 10 watts to 18,000 watts.